Radioactive Exit Sign Disposal | Tritium Disposal | ADCO Services, Inc.
Self-luminous radioactive Tritium H3 exit sign disposal service is offered by ADCO Services to generators of radioactive exit sign waste in The United States. 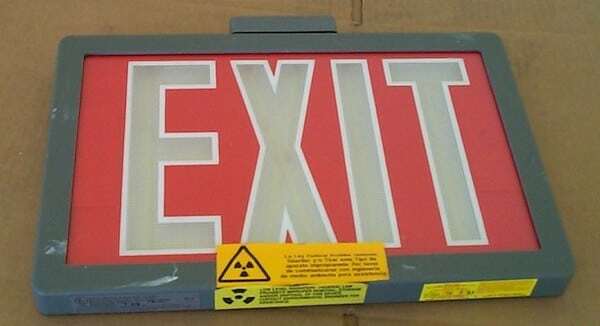 Radioactive exit signs are sometimes used in facilities such as: skyscrapers / high rises, hospitals, universities, tunnels, airplanes, and office buildings where electrical lines are difficult to run. These self-powered exit signs often contain Curie amounts of Tritium (H-3) contained in glass tubes which illuminate the lettering on the exit sign typically in a greenish colored glow. If you find yourself asking, “What do I do with a radioactive exit sign?” or “How do I dispose of a radioactive exit sign?” remember this: Tritium, while not overly harmful, must be handled properly to avoid Tritium contamination. It is of utmost importance that radioactive exit signs be handled with care to avoid breakage of the glass tubes located inside the exit sign housing containing the Tritium. These signs are to NEVER be thrown away in the regular trash! Let the experts at ADCO Services who have handled the disposal of over 10,000 radioactive exit signs throughout ADCO’s history take the hassle out of properly disposing of your radioactive exit signs. Be sure to ask about ADCO’s self-luminous exit sign packaging options. ADCO can assist you with obtaining the proper packaging for your Tritium exit signs and provide you with the proper packaging instructions on how to pack your radioactive exit signs to ready them for proper recycling / disposal. Our staff is fully trained on how to handle H-3 exit signs and have assisted customers across the entire United States with the disposal of their Tritium exit signs. At ADCO Services we take pride in dealing with your waste removal needs and will provide you with the level of quality service you expect. If you have any questions regarding radioactive exit sign disposal or if you would like to discuss your hazardous waste disposal needs with an expert, contact us at 877-254-2326 or 708-429-1660 today. Radioactive Tritium (H3) Exit Sign Disposal Services are offered by ADCO. ADCO Services can dispose / recycle self-luminous glow in the dark exit signs that are expired and even broken or just unwanted. We offer cost-effective disposal options making it easy to recycle your radioactive exit signs.